Hosts from time immemorial have worried that no one will show up to their shindigs. On the flip side, what if you try to have a soft opening and everybody comes? According to Charlie Menard, executive chef of the Inn at Round Barn Farm, that's exactly what happened last Thursday when the inn's team opened its new snack bar in Waitsfield's Village Square, Canteen Creemee Company. "It's a small town. Word got out," Menard explains. By Saturday, the line was 30 deep before the snack bar even opened. What made the throngs so eager? Fare such as kimchi burgers with the fermented cabbage mixed right into the beef; fried chicken with corn pudding and various sauces, including Sriracha butter; and "next-level sundaes." Those include the Someone Else's Wedding Cake, made with marshmallow and chocolate twist soft-serve, covered in white-chocolate-and-olive-oil dip and garnished with fondant flowers. 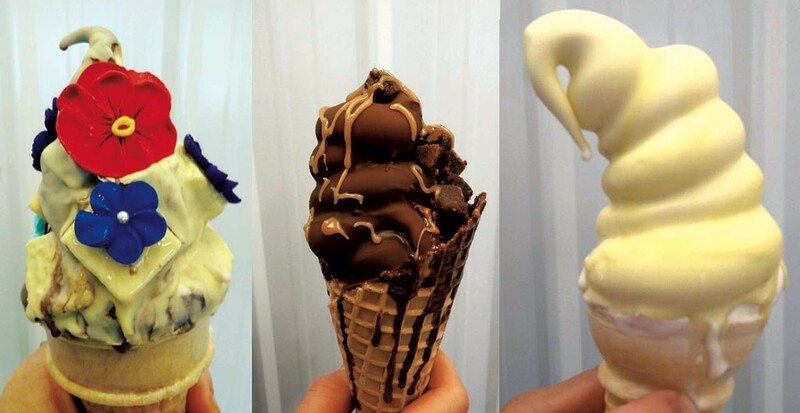 Menard notes that the creemee mixes and chocolate dips are made in-house using high-quality ingredients; beef for the burgers comes from the Mad River Valley. "It's pretty much your classic modern snack bar," he says, "the sweet and salty things that make my life better every day." As of press time, CCC's summer hours are Tuesday through Sunday, 11:30 a.m. to 8 p.m. Check the Facebook page for updates. The original print version of this article was headlined "Ice Cream Line"